Having met at Mark’s to sort out equipment and who was going with whom etc, eight members travelled over in convoy to Robin Hood Bay, arriving in good time at the campsite. A bank of cloud in the west just couldn’t make its mind up which way to trundle, but skies to the south, east and northeast remained pretty clear at the start. With seven scopes deployed, interest on the campsite was high, and a considerable gathering massed behind the instruments. Mark demonstrated the scale solar system, with help from the audience, who were keen to assist and much enjoyed being part of the solar system for a little while. 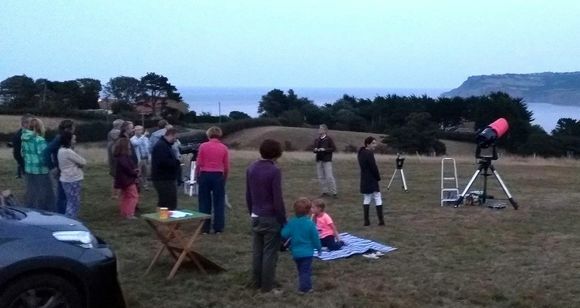 As twilight deepened the manual scopes were turned toward Saturn before the pesky cloud bank obscured it. 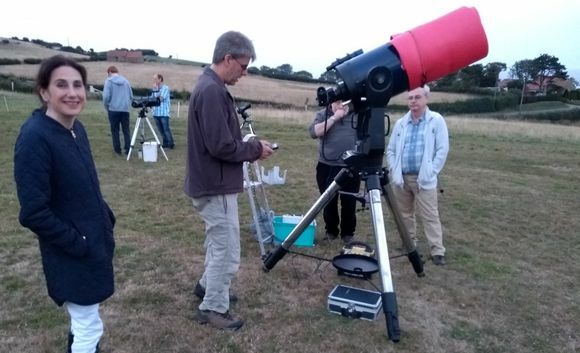 The Meade LX 200, as we know, has to be correctly aligned with guard stars, which takes time, so only perhaps ten minutes of viewing Saturn was possible before the inevitable happened and clouds hid it for the rest of the event. 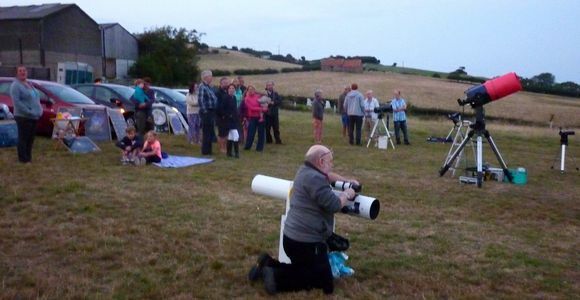 Still, Mars was well placed and remained on view long enough for everyone to have a good look through the eyepiece. It did eventually disappear behind cloud. Our pesky cloud bank then fragmented for a while allowing a laser point tour to be partially undertaken, before attention turned toward deep sky objects. A game of hide and seek thereafter ensued with many of our favourites visible in patches of clear, before patches of cloud hid them again. Still, i think we managed as people stayed with us, asking some great questions, although the sausage rolls may have helped. By 22:00h cloud started to gain the upper hand, reducing our available sky to a small portion in the east and so we called it a night. Not the clearest conditions we have experienced from Hook’s, but nevertheless it was just good enough for everyone to wend their way home pretty satisfied with all that they has seen, heard and experienced. Thanks to Andy L, Barbara and Mark, Elaine and Lee for transportation, Andy, John, Keith and Lee with scope assistance.